The first coins minted in Japan were the Wadou Kaichin made by the imperial government in 708. Following that, eleven varieties of coins were minted until the year 958, at which point the government quit minting cash coins. Even during the age of Japanese imperial minting, Chinese coins circulated as currency and were probably much more common than the imperial ones which are quite scarce. Chinese coins were imported in great quantities and were the standard currency until the early-to-mid 1600's. Privately, many people in Japan manufactured counterfeit coins with Chinese or, less commonly, Japanese inscriptions. The 16th century was the heyday of such minting, much of which was sponsored by local warlord governments. In the 17th century the Tokugawa government began minting its own coins. The first three eras, Keichou (1596-1614), Genna (1615-1623), and Kan'ei (1624-1643 see image above), each had coins with the era inscription on the face. Curiously the government decided to stick with the Kan'ei legend for all low value cash coins it minted until the 1860's, even though many new eras came about. This was unlike China, which after the 900's always used new reign names on the coins, but was like Korea, which stuck with one legend for a very long period. 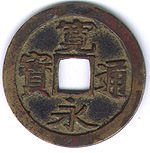 In the 1860's the government began issuing a small value cash coin with a new legend, the Bunkyuu tsuuhou. About this time many domainal lords also began minting their own cash coins.